The British government has announced plans to launch a new NHS mobile app that will let patients in England make appointments with their doctor. The app will also allow users to order repeat prescriptions, manage their long-term healthcare, see their medical records, and quickly access 111 for urgent queries. In addition, users will have access to patient preferences related to data sharing, organ donation, and end-of-life care. Health Secretary Jeremy Hunt described the app as a "birthday present from the NHS to the British people", 70 years after the service was founded. The NHS app is a world-first which will put patients firmly in the driving seat and revolutionize the way we access health services. I want this innovation to mark the death-knell of the 8am scramble for GP appointments that infuriates so many patients. Technology has transformed everyday life when it comes to banking, travel and shopping. Health matters much more to all of us, and the prize of that same digital revolution in healthcare isn't just convenience but lives improved, extended and saved. As the NHS turns 70 and we draw up a long-term plan for the NHS on the back of our £394 million a week funding boost, it's time to catch up and unleash the power of technology to transform everyday life for patients. 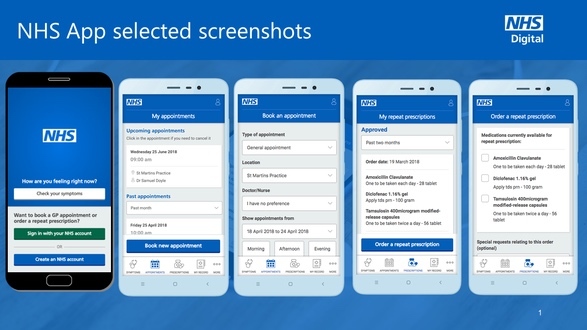 "The new app will put the NHS into the pocket of everyone in England but it is just one step on the journey," said Matthew Swindells, NHS England National Director of Operations and Information. "We are also developing an NHS Apps Library and putting free NHS Wi-Fi in GP surgeries and hospitals." Developed by NHS Digital and NHS England, the app will enter its testing phase in September and then roll out officially in December. It will be available on iOS devices through the App Store, as well as on Android phones via Google Play. The NHS could be fixed with ease. Ban free healthcare for drug addicts, alcoholics and obese - make them pay for their own self inflicated problems. Why should people who look after their health subsidise those who don’t? Absolutely! And let's ban those who get injured in road accidents, because they knew the dangers and chose to drive anyway. But let's also ban it for those who choose to walk, because they knew spending time outside was exposing them to pollution. Let's also ban it for disabled people if the parents were warned in advance that conceiving would result in a high risk of disability. We should also ban it for anyone using any kind of machinery that has a non-zero chance of causing injury. But why stop there? Let's ban it for anyone that does anything that has a non-zero chance of injury, that's self-infliction and I'll be damned if I'm paying for that! If you prefer a system where people needlessly die because "my tax money shouldn't go there", feel free to move to a country that doesn't have universal healthcare. There's plenty of them. Meanwhile, the rest of us who believe that every human has a basic right to not die from completely curable ailments will continue to support a system that provides unbiased universal healthcare to everyone. I’m all for it though, absolutely stupid the current free for all system. Far too many pensioners taking all the appointments over nothing resulting in a nightmare for younger people trying to get an occasional appointment. Sister nearly died of sepsis thanks to A, incredibly rude and unhelpful receptionist staff and B, pensioners taking forever while she nearly passed out in the waiting room. Also give £20 fines for those who fail to turn up to appointments. The UK lacks any sense of personal responsibility. Perhaps focusing everything in one straight forward location is a good idea? I certainly think so. A bit like the gov.uk website that focused all information in one place with easy to use and find interfaces. Addiction, Alcoholism and Obesity are often linked with mental health problems such as depression. You cannot ban those patients from using the NHS. Besides, those people will be paying tax one way or another and so would be more than entitled to NHS care. How is this any different from the multiple apps that already exist? Seems like a waste of resources. Agreed. Been doing this for several years now with the "Patient Access" application. OK, so "application" is stretching it a bit since it is just an app wrapper around the website but you could say that of many apps from lazy developers. I haven't needed to book an appointment with a doctor for years now (fortunately), but I've been ordering repeat prescriptions in the app for multiple years. People in the UK could give the NHS their own present by looking after themselves better and stop abusing the system. The British government has announced ('https://www.gov.uk/government/news/new-nhs-app-will-make-it-quicker-and-easier-to-access-health-services') plans to launch a new NHS mobile app that will let patients in England make appointments with their doctor. All well and good but it will fall down on the back end. GP surgeries are managed independently of the NHS, as are the IT management contracts. How many of the thousands of GP surgeries across the UK will support the app come December? My view is very few outside of the pathfinder areas. Because while the NHS seems to most people to be one big organisation, it is in fact not. The NHS in Scotland for example is entirely separate from the NHS in England and is devolved to the Scottish government, which is the reason we still have a functioning NHS in Scotland. Ban free healthcare for drug addicts, alcoholics and obese - make them pay for their own self inflicated problems. Why should people who look after their health subsidise those who don’t? The answer is pretty simple, you don’t have the slightest idea what you are talking about nor do you care to do any research because you like to feel superior to other human beings. Cost of giving a drug addict methadone is much cheaper than policing drug crime. With the added benefit of being able to wean someone off drugs and into employment. Try reading some research and statistics instead of the Daily Mail. When you read about all the services that Estonia has available online, the UK feels like it’s lagging, so this is a step in the right direction. Compared to Estonia the UK may as well be scratching text into stone tablets. When Scotland becomes independent I very much hope we will implement a similar programme. it's because the UK is currently a union of four countries: England, Scotland, Wales and Northern Ireland. The NHS is devolved within the separate governments & assemblies of those 4 countries, except England, which does not have a govenment. A major data breach waiting to happen when the service is launched. Agreed. It is ironic that you've got to be pretty fit to get up and be one step ahead in order to be in there to book an appointment with the Receptionist before the rush because.... :(.. you're ill!